Ann sent in this photo as a follow up to the query “what are some easy fixes in the neighborhood?” from back in November. Clogged storm drain causing water to back into intersection, making handicapped ramp a joke. This issue falls under ‘OTHER’ which is a category city staffers, when asked in meetings, have told us go into a black hole. Perhaps that’s why, after numerous neighbors’ complaints for about three years now, this issue has not been resolved. Photo here taken 12/25/2014…be a nice Christmas gift from the city to fix this. Bennett says “This is happening right now at corner of M and 24th. Thanks for everyone calling, emailing, etc! A bunch of us in the neighborhood have called or submitted See-Click-Fix requests to have this fixed numerous times. Not even phone calls get adequate responses. Maybe we need to work on getting the City’s system for receiving and prioritizing maintenance requests fixed. I know across the river of fire in the southside, anytime we want something fixed that has been in see click fix for a while, a call to our council rep usually does the trick. Multiple calls works better. That usually results in a solution. What’s the doc’s number around your parts? #2, James…the river of fire, huh? Calls and emails to our council rep don’t seem to produce much any more. Folks…if things are not getting done…simply email the mayor directly. If you’ve gone through the existing channels and those efforts produced no results…go straight to the top. 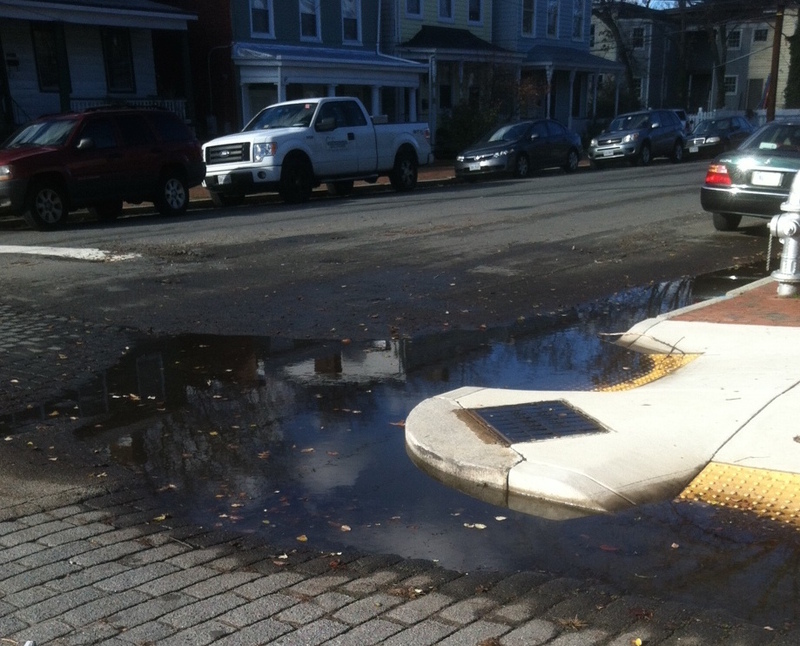 Isn’t money raised from the Stormwater tax, I mean, fee supposed to be used to fix this? So far I see seven votes on click fix. If everyone here, both those commenting and those liking it on facebook, put in a vote, then at least there would be a bunch of votes to point to when it gets escalated within the city. Come on folks, we got a trash can, let’s see if we can get this drain fixed. Couple of months ago, I got a notification that a neighbor had put in a request for a street light; I voted for it, and it was marked closed and fixed. It was not fixed; same neighbor opened same case again, I voted again, and neighbor had a real dialogue with someone at the city about it – end result, light got fixed. Took two months and a lot of back and forth, but it got fixed. it seems the problem here is where the drain is placed… why it is on top of the sidewalk like that, i don’t know. if it was a clogged drain under the sidewalk that COULD be cleaned out, i’m sure that would happen. seems to be poor engineering. I just realized it’s being fixed NOW. YAY! Thanks Bennett for the photo! First, there were awesome bike lanes drawn on the MLK Bridge; then a trash can that mysteriously appeared at the bus stop; followed by news of the miraculously low murder rate in the east end; and now, the “pond” at 24th & M St. is finally being addressed (fixed? )…who said elfin magic doesn’t exist up here on the Hill. Folks, be careful what you wish for…you might just get it! OK Santa, can we start working on getting me that Red Ryder BB gun…PLEASE! @ 12, the drain isn’t on top of the sidewalk–that’s the manhole cover. The stormwater inlet is under the curb, but it’s constantly backed up. It was being vacuumed out when I stopped at home at lunchtime today, but that’s not a permanent fix–they’ve vacuumed it out numerous times over the past few years. I have a feeling a permanent fix is a lot more involved than the City has budgeted; it’s time to get that item in the capital plan. @15 Lora, maybe you should work on getting it into the budget. The storm drain at the NE corner of 25th and Main backed up constantly, and we complained for at least a year; eventually they closed half of 25th St. and spent a month or so tearing it out and completely rebuilding it. I’m not sure where that came from in the budget, might be worth trying to find out. Sharon North is the spokeswoman for the Dept. of Public Works, her phone is in the city employee directory, she might be able to tell you how to approach this. I talked with the guys that were working on the clean up yesterday. (Super-cool vacuum truck they have, btw) I looked down the open man hole cover, and there is a massive…mass, I guess…of brick and concrete that blocks a good bit of the opening to the lateral drain that moves water into the storm water main. I had heard that years ago some guys that were doing some work dumped some left over cement into the drain and it’s been a problem ever since. This was back in the early 90’s, so I’m told. From what I saw at the bottom of the hole, there may be some truth to that. It’s a bigger fix than just taking out the trash that gets down there, but the team the city sent out did break up as much of the concrete and brick obstruction as they could and they sucked out quite a few bricks with their super-cool vacuum truck, so I guess we’ll just have to wait and see what happens during the next big rain. #18, Bennett…good and very informative update. Thanks! So, we wait and see, thank the city for working to resolve this long-standing problem…and get a shovel and trash can to the guy who suggested we fix this ourselves.